It seems there are few things Heather Graham can’t turn into a book. Even her bibliography is headed toward novel-length territory: Graham has written more than 200 novels, with 60 million books in print in 25 languages. Last year alone, she released entries in four series (including her fan-favorite Krewe of Hunters paranormal line), contributed to the Jonathan Maberry-edited anthology Hardboiled Horror, launched a new YA sci-fi trilogy with co-author Jon Land, and penned a suspense thriller with actor Chad Michael Murray. Graham kicked off 2018 with the release of a new installment in her Finnegan Connection miniseries, and three new Krewe of Hunters titles are set to drop this summer. For now, though, Graham is taking a rare breather to celebrate the release of her latest romantic thriller. 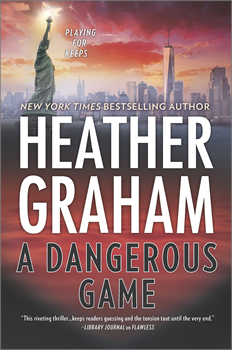 A DANGEROUS GAME, out now from Mira Books, is the third entry in the New York Confidential series, which centers on Manhattan-based criminal psychologist Kieran Finnegan and her love interest, FBI agent Craig Frasier. 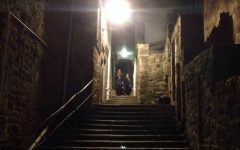 In the new installment, Kieran is preparing to leave her office one evening when a distraught woman thrusts an infant into her arms, only to be stabbed to death by a mysterious assailant as she flees. The unharmed baby is quickly taken into official care as police work to identify the victim and her attacker, but Kieran can’t let the incident go. When she pursues a lead she uncovers at the pub owned by her family, Kieran is drawn into the brutal world of human trafficking. If there’s a downside to a catalog of titles that grows as quickly as Graham’s, it’s that each effort quickly cedes the stage to the next. So we’re happy that the New York Times and USA Today bestselling author carved a few minutes out of her schedule to shine a spotlight on her latest novel—and talk with The Big Thrill about satisfying reader expectations while maintaining a release calendar that would’ve sent Agatha Christie running for the sherry cabinet. Can you pinpoint a moment or incident that sparked the idea for A DANGEROUS GAME? The series itself is based on a family-owned Irish pub on Broadway in NYC, which came about because my mom was born in Ireland and she was always very picky about her pubs. Finnegan’s was created in her memory, and also because I love the downtown area of Manhattan—with Trinity, St. Paul’s, Wall Street—and so much history! I have a friend who is a naturalized citizen, born in Nicaragua, and [when] her mother tried to bring the family to the States, she was swindled and cheated and just more or less dumped in the desert with two small children. Her mom is wonderful—I never knew of anyone who worked harder to become an American, cleaning just about 24 hours a day to support her family. We were watching a show, and she told me about some of the things that had happened to friends—much worse, she thought, than her own story, because they had been bought and sold over and over again. It’s a real problem—the American dream is such a beautiful ideal, but, quite tragically, there are those ready to twist those dreams into torture for many. The silver lining is that our country is filled with strong and wonderful people willing to see that such cruelty is stopped. And, of course, the wonderful experiences I have had with ThrillerFest and the FBI helped give me a great deal of what I needed! I was a lucky kid—my mom and my dad’s family came into the country through sponsors. Because of them, I never forget to be grateful—or note the plight that many others face. Hopefully, too, it’s just a fun and exciting read! It’s an entertaining story laced with humor and romance, but there’s a very dark crime at its center. What are your thoughts on walking that tonal tightrope? By now, your regular readers are pretty familiar with Kieran, who’s headlined two previous New York Confidential novels. 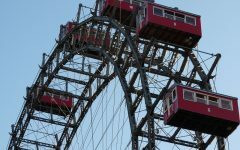 How do you strike a balance between satisfying loyal fans and making sure new readers can jump onboard? That’s always tricky, too. One thing we learn—and no matter how long we’ve been writing we have to remember—is that an information dump can be very boring. I try to filter in past information that is important. Starting with action or conversation is one way to work, and filling in what might be important with someone commenting on it can work. It’s always a balance, as you say, and the hope is to get it as close to “right” as possible. What is it about Kieran that makes her fun to write? I think that the first book in the series [2016’s Flawless] helped define Kieran for me. She’s incredibly loyal to her family, and often at odds because of them. Her brothers have a talent for getting into trouble, and, as a criminal psychologist, she is also very aware of the law. The good is that even when they’re getting into trouble, her brothers have a sound moral compass—their intentions are always the best. She loves the tradition of the family pub, but has her own path in mind, and is always grateful that it’s her older brother who is in charge of the pub. She loves people and is fascinated by them, and, of course, living with an FBI agent, she is always walking the line. If she isn’t in the middle of a situation herself, she can wind up in one with Craig. Was there ever a time when you struggled with the discipline it takes to maintain your output? I was a lucky kid and grew up with two avid readers as parents. I can’t imagine just sitting anywhere without something to read. I think that may transfer into writing—I just absolutely love what I do, and I know that I’m privileged to do it for a living. I’m also fascinated by the truth of our world—there’s always something you can find in history that is bizarre, touching, fascinating, and more that gets the mind ticking. And you don’t just write a lot of books; you write a lot of books that keep your readers happy. With such a grueling release schedule, what are some work habits you’ve developed to make sure the quality of your work stays high? I’ve been lucky enough to work with wonderfully talented editors—right now, Nicole Brebner and Margot Mallinson at Mira/Harper. I also coerce a few friends into reading my work during the process, especially when [their expertise is relevant to the book]. For instance, I love New York, but I’m not a New Yorker, so I’ll ask a New Yorker to make sure I’ve got the city and the vibe of things right. I also love concentrated writing—working every day, even if it’s only thirty minutes, to keep what I’m doing fresh in my mind. (Yes, there are times I miss!) But, again, I’m so lucky. I love what I do. And, next March, Kieran finds herself on a privately owned island off of Manhattan, where accidental deaths may or may not have to do with the Vikings in the New World and the possibility that the Arc of the Covenant did make it across the Atlantic, thanks to the Knights Templar.